In telecommunications and signal processing, frequency modulation (FM) conveys information over a carrier wave by varying its instantaneous frequency. This is in contrast with amplitude modulation, in which the amplitude of the carrier is varied while its frequency remains constant. But in frequency modulation the carrier is varied while its amplitude remains constant. Frequency modulation can be regarded as phase modulation where the carrier phase modulation is the time integral of the FM modulating signal. Frequency modulation (FM) and phase modulation (PM) both of which are commonly known as angle modulation. Both FM and PM are used extensively in communications systems. FM is used in radio broadcasting, for the transmission of the sound signal in standard (NTSC)TV, for private land-mobile radio systems, for direct-satellite broadcasting, and for cordless and cellular telephone systems, just to name a few common applications. In our group, we choose walkie-talkie as the application of the frequency modulation. A walkie-talkie or handie-talkie(more formally known as a handheld transeiver) is a hand-held, portable, two-way radio transceiver. Its development during the Second World War has been variously credited to Donald L. Hings, radio engineer Alfred J. Gross, and engineering teams at Motorola. Similar designs were created for other armed forces, and after the war, walkie-talkies spread to public safety and eventually commercial and jobsite work. Major characteristics include a half-duplex channel (only one radio transmits at a time, though any number can listen) and a "push-to-talk" (P.T.T) switch that starts transmission. 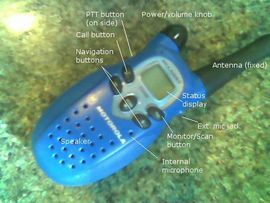 Typical walkie-talkies resemble a telephone handset, possibly slightly larger but still a single unit, with an antenna sticking out of the top. Where a phone's earpiece is only loud enough to be heard by the user, a walkie-talkie's built-in speaker can be heard by the user and those in the user's immediate vicinity. Hand-held transceivers may be used to communicate between each other, or to vehicle-mounted or base stations. The first radio receiver/transmitter to be widely nicknamed "Walkie-Talkie" was the backpacked Motorola SCR-300, created by an engineering team in 1940 at the Galvin Manufacturing Company (fore-runner of Motorola). The team consisted of Dan Noble, who conceived of the design using frequency modulation, Raymond Yoder, Henryk Magnuski who was the principalRF engineer, Marion Bond, Lloyd Morris, and Bill Vogel. Colonel Roger Colton at Fort Monmouth made the important decision to shift these tactical devices to frequency modulation (FM) because it would allow reliable, static-free single channel radio communication, even between moving vehicles. FM inventor Edwin Howard Armstrong donated his time and patents for military equipment. Initial FM military radios were for vehicles, as they were too heavy for man-carry portability. The first portable FM two-way radio for the Signal Corps was designed by Daniel E. Noble (1901-1980), an engineer working for Galvin. Weighing 35 to 40 pounds, the radio became the SCR-300 backpack unit, used channels in the 40-48 MHz spectrum, and offered a range of up to 20 miles. Based on battery power, this was the "real" walkie-talkie, the Army's first handheld portable, two-way FM transceiver. The original version used a half-duplex channel (only one radio transmits at a time, though any number can listen) and a push-to-talk switch that began transmission. The walkie-talkie's built-in speaker could be heard by the user but also those in his immediate vicinity (a feature sometimes helpful, but often not if enemy forces were nearby). Basically, a radio communication system consists of a transmitter, a channel, and a receiver. source, and antenna in the transmitter. The energy source powers the amplifiers. In FM, the audio signals cause the FM carrier signal to change frequency above and below assigned center frequency. In FM, the amplitude of the audio signal is proportional to the amount of frequency shift above and below the carrier frequency.